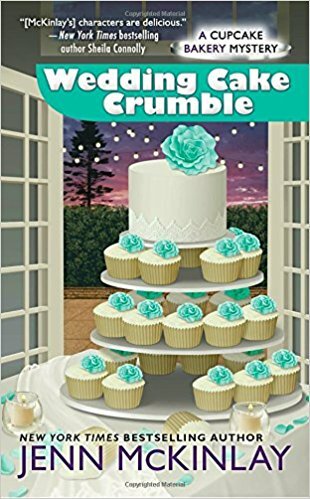 This week we have a review of Wedding Cake Crumble by Jenn McKinlay along with a fun guest post by Jenn about weddings and a recipe for Champagne Cupcakes. Details at the end of this post on how to enter to win a copy of Wedding Cake Crumble, and a link to purchase it from Amazon, and an indie bookstore where a portion of the sale goes to help support KRL. It seems like it’s been a long time coming, but best friends Angie DeLaura and Tate Harper are finally getting married. 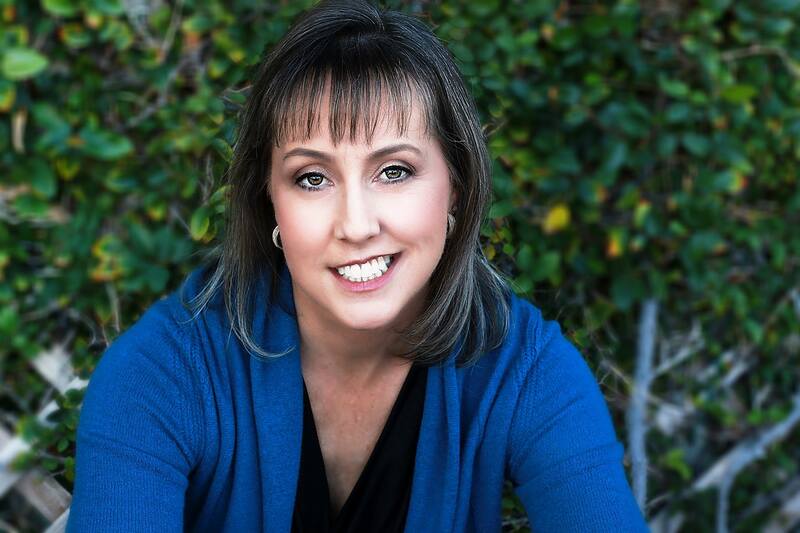 Not only are they now business partners franchising Scottsdale’s Fairy Tale Cupcakes, but together with Melanie Cooper they have shared a love for movies and food since childhood. Investigating murders has been a more recent development, which is why when their florist is a little late, Mel instinctively expects the worse. Although Annabelle Martin is just fine, the same can’t be said for the wedding photographer, Blaise Ione. As more vendors fall to the wayside due to premature death, Mel and Angie can’t help but begin to suspect that they may be carrying around some serious bad mojo. With one of their own staff baking Angie’s and Tate’s wedding cake, Mel feels even further invested in stopping the curse in its tracks. Police bodyguards seem to have the matter in hand though, leaving Mel free to answer an S.O.S. call from a fellow businesswoman and bookstore owner Cassie Leighton. A new tell-all by former Scottsdale socialite Elise Penworthy guarantees a huge audience for A Likely Story’s booksigning event, if only for residents to have the first opportunity to spot themselves within the thinly-guised novel. Baking five-hundred cupcakes overnight is a small price to pay when it leads to further clues as to what is causing the rising death rate, all seemingly related to the wealthy town and its entitled inhabitants. This tenth novel of the series rewards readers for their loyalty with a genuinely satisfying, warm-hearted mystery. Mel has found true love with her childhood crush Joe DeLaura, Angie’s brother, and perhaps the sanest of her overprotective family. Although she never doubts Joe’s love, Mel is having understandable qualms over so much change suddenly coming into all of their lives. The inexplicable batch of murders certainly doesn’t help, although Mel and Angie prove more than a little talented at tracking down the many suspects who come to light. The novel is never more enjoyable than when it explores the satire-worthy echelons of high society, whose marriages are as fluid as they are temporary. Mel’s success at putting together all of the clues highlights not just her intelligence, but the author’s skill at planting clues and crafting a nuanced plot. Cupcake recipes are of course included, yet the real treat for readers are these engaging characters who more than deserve their happily-ever-afters. Besties. BFFs. Kindred spirits. Gal pals. Friends for Life. Sisters from different misters. Whatever you call your numero uno, is there anything more challenging than watching your best friend get married, knowing that you are now relegated to the number two spot in her world? It’s the first big life change for a friendship, the efficacy study of its durability if you will. Because now your pal comes with a sidekick, and it isn’t you. I’m sure there are greater challenges in life, but still I remember when my best friend, Cyndi, got married and I was left, in a puffy sleeved, sequined emerald green satin dress, wondering where the heck I now fit into her life? It took us almost a year, yes, a whole year, to find our footing. After the wedding, we (and by “we” I mean “she”) were consumed with talking, talking, talking about the wedding, reviewing the video footage, looking at the album, debating whether the cake had been all that, and writing the seemingly endless amount of thank you notes that needed to be sent. Yes, all of that. But eventually, things settled down and we were back at our old stomping ground, the mall, trying on goofy hats, dresses we couldn’t afford, drinking Orange Julius, doing our Christmas shopping, and taking prank photos of us, sitting on Santa’s lap. He was a jolly old elf, indeed. 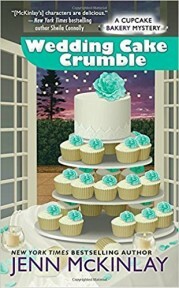 In Wedding Cake Crumble, Melanie Cooper is maid of honor to her long time bestie Angie DeLaura. Even though Angie is marrying Mel’s other best friend, Tate Harper, Mel still has a few moments of “Where did my best friend go?” Since they were twelve years old, Mel and Angie have been as inseparable as Thelma and Louise or Romy and Michele. Now that Angie is going to become Mrs. Tate Harper, Mel feels the need to tell her best friend how very grateful she is that Angie has been in her life and that no matter what, she’ll always be there for her. Always. But weddings are chaotic and when the vendors Angie has hired for her big day keep turning up dead, Mel and the cupcake crew fear that someone is out to stop the wedding. But who? And why? When Angie takes a last minute job catering cupcakes at a book signing for the local celebrity author Elise Penworthy, to take her mind off the murders, the already packed schedule gives them no wiggle room and Mel has no opportunity to tell her friend about her feelings. As the body count rises, shockingly, the bestselling author is the next to turn up dead. Mel realizes there is a connection between all of the murders and, as maid of honor, she must figure it out if she wants her best friend’s wedding to go off without a hitch. After all these years, Angie and Tate have earned their happily ever after and Mel is determined that nothing, not even attempted murder, will stop it. Do Mel and Angie have their moment? Do they solve the murders? Do Tate and Angie actually make it down the aisle? Find out in Wedding Cake Crumble, available now! Happy Reading! Champagne Cupcakes: A light fluffy cake topped with champagne frosting. Directions: Preheat oven to 350°. Line cupcake pan with paper liners. In a large mixing bowl, cream together butter and sugar until light and fluffy. Add the eggs and the vanilla. In a medium bowl sift together the flour, baking soda, baking powder, and salt. In a small bowl whisk together the sour cream and the champagne. It will fizz a bit. Alternately, add the flour mixture and the champagne mixture to the large bowl, mixing until the batter is smooth. Fill paper liners until two-thirds full. Bake for 17-22 minutes until golden brown. Makes 12 cupcakes. Champagne frosting: Ingredients: 1 cup champagne 2 sticks of butter, softened 2 ½ cups confectioner’s sugar 1 Tablespoon champagne Directions: Simmer one cup of champagne in a small sauce pan until reduced to two tablespoons. Allow to cool. In a small bowl, cream together the butter and sugar until thick and creamy. Add the reduced champagne plus one tablespoon champagne. Whip together until light and fluffy. Decorate the cupcakes with the frosting using a pastry bag. Garnish with champagne colored pearlized sprinkles. To enter to win a copy of Wedding Cake Crumble, simply email KRL at krlcontests@gmail[dot]com by replacing the [dot] with a period, and with the subject line “crumble,” or comment on this article. A winner will be chosen June 2, 2018. U.S. residents only. If entering via email please include your mailing address (so if you win we can get the book sent right out to you), and if via comment please include your email address. Check out other mystery articles, reviews, book giveaways & mystery short stories in our mystery section. And join our mystery Facebook group to keep up with everything mystery we post, and have a chance at some extra giveaways. Also watch for our new mystery podcast coming up very soon! Jenn is the New York Times, USA Today, and Publisher’s Weekly bestselling author of several mystery and romantic comedy series and has recently won the RT Reviewer’s Choice Award for best contemporary love and laughter. She lives in sunny Arizona in a house that is overrun with kids, pets, and her husband’s guitars. I really love this series! Thank you for the giveaway! I forgot to include my email! I adore this series. Always love reading a fun cozy but then again, most, if not all cozies, are fun. I love Jenn’s books, but I haven’t read this series. Thanks for this opportunity! A mystery with a wedding as part of the plot. Can’t wait to read. Great review thank you, I love this series am looking forward to this. I really need to start this series. (Have a lot of catching up to do) I can’t wait to read this one too. Thank you for the chance ?? Love this series. Looking forward to reading this next one. Can’t wait for the latest installment. thanks for the chance to get it soon. Book looks so good. Thanks for the chance at the giveaway. This is a great series and I look forward to reading this latest book. I just might crumble if I was lucky enough to win your book. Would love to read this, I love this series! Thanks for the chance. Love her books! I love cupcakes and excited to check out not only the story but the recipes in the book. I binge read the series and now wait with baited breath for the next one!! I love the Cupcake Bakery series, and I want to read about Angie and Tate’s wedding! Thank you for the chance to win. This is one of my favorite series. Can’t wait to read “Wedding Cake Crumbles”.